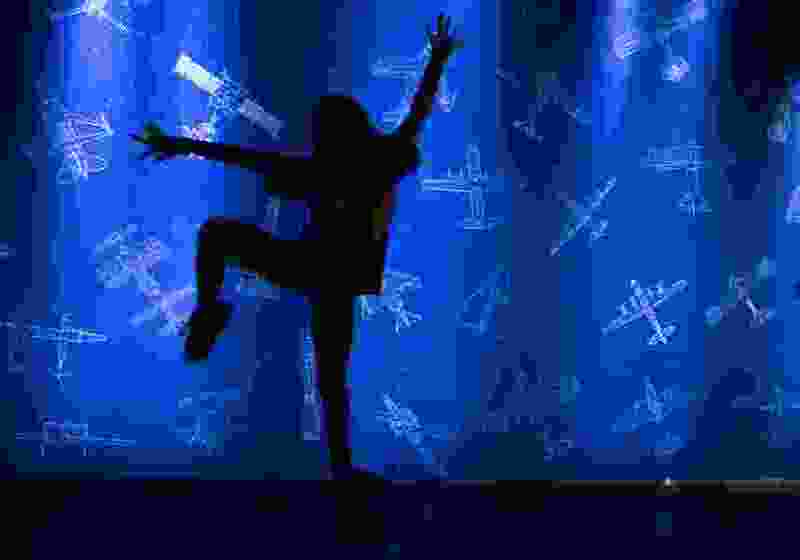 Leah Hogsten | The Salt Lake Tribune A summer camp student is silhouetted against the flight exhibit, Wednesday, August 8, 2018 at The Leonardo Museum. Three months ago, The Leonardo faced an uncertain future and was millions in debt, but now a third of the museum's creditors have forgiven about 20 percent of its total debt outright. Three months ago, weighed down by millions in unpaid debt, the nonprofit science and technology museum on Salt Lake City’s Library Square faced an uncertain future. But members of The Leonardo say they can see a path forward, now that a third of the museum’s creditors have forgiven about 20 percent of its total debt outright. With the rest of their creditors, they’ve negotiated long-term payment plans for the remaining $2.9 million, according to Kathryn Smith, the organization’s chief impact officer. Conversations with creditors mostly took place between June and July and are in their final phases, Smith said. The organization has struggled with debt since its inception in 2011. When The Leonardo opened — six months late — Smith said revenue from traveling exhibits was unpredictable and made long-term financial planning difficult. That, coupled with the startup costs she said are typical for any independent nonprofit, led to the organization’s current financial struggles. Now that the museum’s attention has moved away from traveling exhibits, she said it has better data on its revenue streams and expenses, which will create more stability. “We feel very confident in working with the board of directors, our finance committee, the leadership team here, that we have a very conservative and solid budget that will allow us to start growing some reserve and being able to use those reserves both to invest in growth and to manage the debt,” she said. The group received a $600,000 loan from the Salt Lake City in 2011 to cover operating costs during the delay in its opening. It missed payments on the remaining $248,000 owed in March and April of this year and still owes $270,000 in utility payments to Salt Lake City, according to Matthew Rojas, a spokesman for the mayor’s office. The Leonardo pays $1 a month to rent its building from the city. Salt Lake City Councilman Derek Kitchen, who has been critical in the past of The Leonardo’s business plan and finances, said the recent changes are positive — but he remains wary. Kitchen noted that he doesn’t know the particulars of The Leonardo’s financial plans moving forward and wants to see the museum succeed. But he worries the organization’s focus on fixing debt has distracted from its core mission of serving the community. Smith argued that the museum’s finances have distracted from its recent accomplishments. For example, she noted that among other awards, The Leonardo was recently named the Best Gallery or Museum in Utah for 2018 by the American Art Awards — bringing national recognition to the state and community. And, she said, the museum offered a record number of educational youth camps this year, which saw record attendance.